The enterprise quickly evolved into Bob’s Wholesale where dry grocery products were distributed to bakeries and donut shops in the Kitchener-Waterloo area with all deliveries being shipped in the Flanagan family station wagon. Joe Flanagan recognized a need for a full service distribution and set out to expand geographical coverage and diversify the product line. He renamed the company J. and D. Flanagan Sales and Distribution Ltd., and over the next ten years the company dealt with rapid expansion including new vehicles, a new building in Kitchener (1983), and a new branch in Owen Sound. In 1989, the Kitchener branch was moved again to accommodate the growing demand. The 80s also saw the introduction of Joe’s sons to the family business. Dan, Rick, Jeff and Murray started working at the company in various positions. The company was renamed Flanagan Foodservice Inc. and again, continued to grow. By this time the company viewed the ability to adapt to serve its customer needs as a skill that has been well-developed over the years. Although many businesses were suffering from a recession in the 90s, the company showed no signs of slowing down. Joe Flanagan told employees that the company “wasn’t taking part in the recession.” A true visionary, he led the company through another decade of growth. Expansions to the Kitchener facility were needed and the Sudbury branch was opened. Fresh seafood, dairy, and new marketing initiatives were introduced that helped propel the company forward. With a strong succession plan in place, Joe appointed his eldest son, Dan, as President in 1998. A gradual hand off of the management responsibilities and consensus among the brothers as to the direction of the business allowed for a seamless transition to the second generation. With the passing of Joe Flanagan in 2000, the company was led by Dan, Rick, Jeff and Murray. Each brother was actively involved in the day-to-day management of the company, maintaining the integrity and service that Flanagan Foodservice was built on. Under their leadership, the next 13 years were another period of growth and advancement for the Flanagan brand. The company acquired Roseland Produce, added another 65,000 square feet to the Kitchener branch and became HACCP certified while helping shape the future of food safety in foodservice distribution. Sustainability initiatives were a focus and the company committed to ensuring they were proactively managing the impact on the environment. Dan, Rick, Jeff and Murray kept the spirit of their father alive while staying true to his core values of service, teamwork and growth. In 2012 the owners embarked on a strategic journey which would shape the future of the company for years to come. Flanagan Foodservice unveiled a new logo to complement innovative changes to the company vision, mission, values, and tagline. The focus remained on the company strengths and the evolving business environment while always keeping its customers as the top priority. One value that didn’t change was the company’s commitment to the communities it serves. Flanagan’s has always supported many worthwhile charities. The company is actively involved in We Care, Habitat for Humanity, Speroway and many other worthwhile causes. The company has donated over $1 million dollars to We Care over the years and contributes hundreds of thousands of dollars of food annually to worthwhile causes. The company also introduced paid volunteerism in 2016, encouraging employees to support their communities through effort that is compensated with pay. In 2014, Rick, Jeff and Murray retired from the active management of the family business, leaving the oldest brother, Dan, to lead the family entrepreneurship into the future. The brothers remain as Shareholders and Board Advisors and continue to collaborate on various company projects and initiatives. 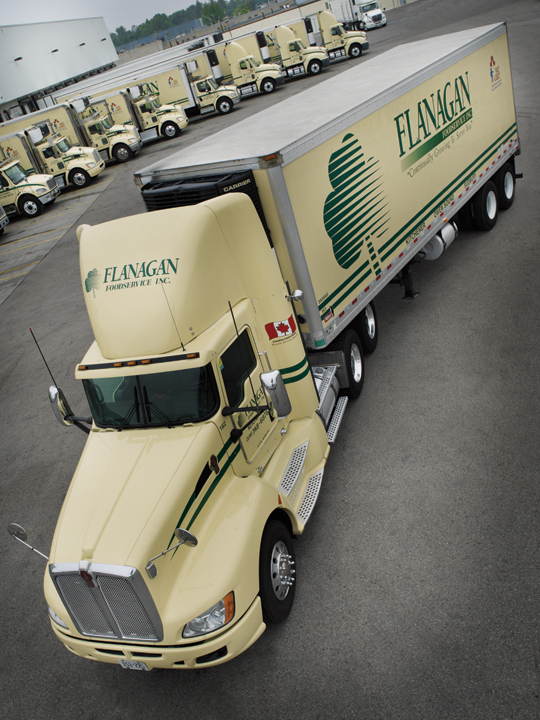 Today, Flanagan Foodservice employs 520 people in 4 branches across Ontario. The fleet consists of over 80 vehicles delivering foodservice products across Ontario and Southwestern Quebec. As the requirements of customers continue to grow, so does Flanagan’s. Through technical innovation and expansions, foresight and marketing, sales have grown consecutively for 40 years. At the heart of it, the Flanagan story comes down to service. Providing exceptional personal service was at the heart of everything Joe and Dee did while establishing and growing the business. In the second generation, the Flanagan brothers embraced that core value while taking the company to the next level. Today, this combined legacy of service provides the core mandate for the future of the company. “Customer service is the cornerstone of our business,” emphasizes Dan. “It really comes down to all of our people understanding how important each and every customer is, and how they can best serve them to meet their unique needs and help contribute to their success in the foodservice market.